Spoilt by the improvements in running in the first two years, I had to drop down a gear this year. 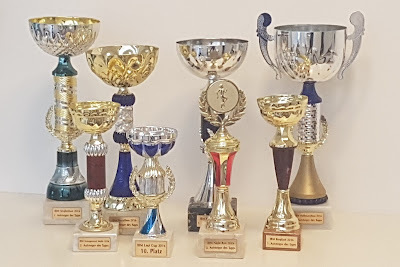 After finishing the first few races in 2015, including two marathons and two halfs, and accumulating 1000 km running by year end, the following year was even better. The improvements over all distances brought me recognition and a nice collection of cups by the Running@IBM club. This year was off to a slow start. Suffering from colds for several months, running was out of question. I reluctantly skipped a long-distance event only after luring a colleague to consider the event, and haven't been training much until recently. With only two long jogs in the last quarter, going for the marathon distance seemed unreasonable, and I postponed the decision to the racing day. After a good first half I decided to go for the full distance anyway. 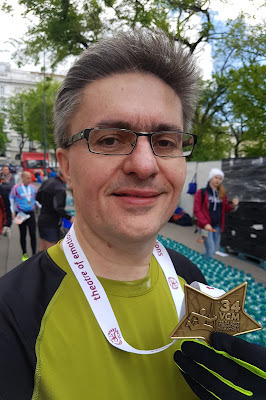 The lack of training did show in the second half when I hit the wall around km 30 but eventually finished, slower than in previous years with 04:55:13 h.
Still an enjoyable run, happy that I made it through!